You may not know this about me. I lead a double life. In addition to being a wardrobe stylist/style blogger, I'm also a social worker (crazy combo I know!). For the past 22 years I've been running The Family Self-Sufficiency Program, a federal (HUD) program that helps low-income families move out of poverty. The majority of my clients are hard-working single moms who are barely making it financially, but doing everything in their power to create a better life for their children. I am constantly in awe of their determination, perseverance and courage. Several years ago, I began collecting clothing donations. I did this not only to help my clients reduce the financial burden of buying new clothes, but even more important to tap into the power of clothes as a tool for boosting self-esteem and increasing the chances of employment. I started a small clothing program right out of my office and help my clients put together outfits that make them look and feel amazing. There are lots of fabulous programs out there like "Dress for Success" that focus solely on work clothes--my little program not only provides work attire but also every day clothes (like jeans), coats, shoes--even accessories. After all, what's a great outfit without a fun bag? My client Nancy (a hardworking single mom of 2 girls) wrote this "The clothes I wear at work make me feel like a CEO. I wear my clothes with pride, happiness and confidence. The best part is that I get a lot of compliments from different people at work, even my director loves my style and asks me where I get my clothes from. I love all my clothes--they give me a large boost of confidence." Clothes are powerful. 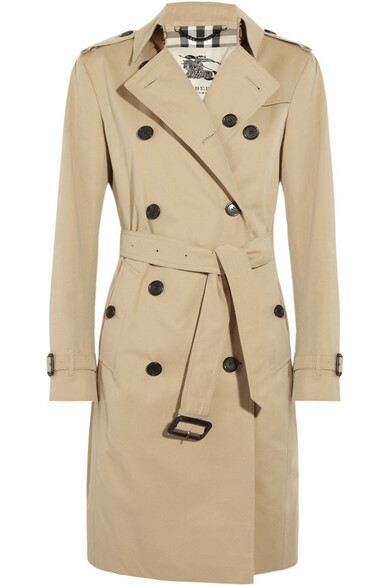 Over the years I've seen clothes actually change lives...thus the story of the Burberry coat. Rachel had been working in low-wage jobs her whole life. She went back to school in her 40's and got a college degree (while raising kids and working). After graduating from college, she landed a professional job as an outreach worker for a non-profit organization. Rachel's self-esteem was low (she had a tough life and no positive role models) so she was very nervous about "fitting in" at the new job and having the right clothes to look the part. I wanted to give her something special to wear that would boost her self-confidence and make her feel on top of the world. One of my private clients had donated a Burberry trench-coat to the program, so I gave it to Rachel to wear on her first day of work day of work. As soon as she tried the coat on she lit up. She came to see me a month later and said that the coat literally changed her life. She felt empowered and self-confident when she wore it. She felt like people listened to her and respected her. She felt professional. Rachel had never even heard of Burberry and had no idea of how expensive it was, but for whatever reason this particular coat made her feel special. Every time she wore it, she felt as if she could conquer the world. That’s the power of clothes. So the next time you're purging your closet, think about donating your pieces to a local clothing program...you can make a huge impact on someone's life with those suede pumps! I want to thank all of my amazing private clients, community members and businesses that donate to my program. It truly "takes a village". And oh by the way, the program now has a name, Uncommon Threads, and it's up for a state award! You are so sweet Margaret---I'm really not. I get so much personal satisfaction from what I do :) It's selfish actually. Congratulations!! What a wonderful thing you are doing!